Please Don’t Ride the Elephants – this post is actually serious. Please Don’t Ride The Elephants – A Serious Note. Planning on going to Thailand for a holiday soon? Thinking you’d like to have a ride on an elephant or maybe watch elephants paint pictures while you’re there? Consider this first – the elephant you have a ride on may well be living a harsh and lonely life. I’m writing this from the Elephant Nature Park, an hour or so from Chiang Mai in the North of Thailand. My friend Ursula and I have come here for seven days to help out as volunteers. The elephant park was started in 1995 by Lek Chailert who, whenever she can, rescues elephants from unhappy situations and gifts to them freedom from what is more often than not, a life of slavery. In several countries where domestic or working Asian elephants are found, those elephants have all gone through a tortuous ritual – a six thousand-year-old tradition designed to demolish the elephant’s spirit and make it obedient to man. The young elephant is taken from its mother when it’s between the ages of two and four years and should still be suckling, and put into a device or a situation where it can hardly move. It will spend three days or more in this situation where it is beaten, stabbed and poked by sticks that have had nails mounted in the ends. The elephant is jabbed all over its body, including its eyes, sensitive inner ears and its feet. It is deprived of food and kept thirsty until it has lost all signs of rebellion – only then is it released. If it survives, this is only the beginning of an entire lifetime of being shouted at, chained up, isolated from other elephants, underfed, overworked and in some cases drugged with amphetamines so that it can be driven to work for longer hours and fed less food. The elephants are kept in line using ankus – metal sticks with a large hook at the end that stabs into their hide, undoubtedly reminding them of their initial torture experience. On one of our first nights here we are shown a video that was filmed during this ritual. Some people find it too traumatic to watch and leave the room. The rest of us reel out afterwards, completely sobered by the fact that the elephants we are getting to know here have gone through this, the squeals and trumpeting of the victims still ringing in our ears. Not a single one of us speaks. Asian elephants are now considered to be an endangered species, and if we don’t become more aware and active on their behalf, we may well be only able to show photos of them to our grandchildren. Thankfully, the thirty four or so elephants here at the Elephant Nature Park are treated with kindness and compassion, roam freely around the grounds in the daytime, are fed regularly, receive routine veterinary care and are kept in shelters at night. 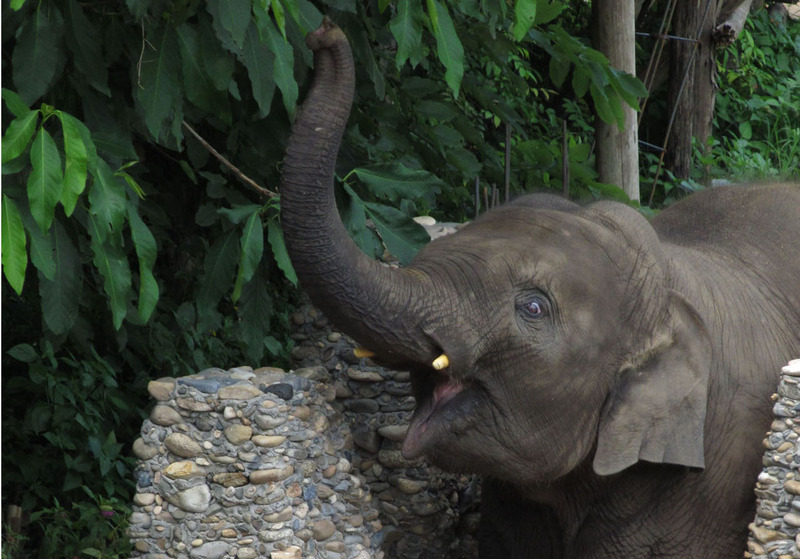 The park has a no hook, no ride policy – even the mahouts are discouraged from riding the elephants. Each elephant has its own mahout, who, at this establishment, acts more as a babysitter than a driver. Partially funded by donations from elephant lovers worldwide, the park’s main income is from the many visitors and volunteers that come here throughout the year for an up close and personal elephant encounter. As volunteers for a seven-day period, Ursula and I have been given our own hut to stay in, which boasts twin beds with mosquito nets, a private bathroom and a gorgeous view of gardens and rainforest-covered hills out the windows. We are fed an astonishing range of delicious vegetarian food three times a day and for a small price we can enjoy a massage by the local tribal people at the end of our daily working stint. Our work includes preparing elephant food, cutting corn for them, unloading truckloads of bananas and watermelons, mending fences, cleaning out the elephants’ night quarters and a variety of other chores. In return, we have been able to bathe and hand-feed the elephants, talk with them, caress them, learn their life stories – many of them tragic – and enjoy delightful moments such as seeing them meander by at eye level, just a few feet away, as we drink our morning coffees. This afternoon I sat watching two elephants enjoying a bath in the river. While I was filming them, they came out of the river and right up to me within about two feet of where I was sitting. The mahout then sat right in front of me and fed them a large bunch of bananas. Sitting below these two giants, spending a quiet half hour with them and their mahout was one of the most magical times of my entire life. Lek’s elephant park is working very hard to teach elephant owners, mahouts and tourists that domestic elephants can be kept in an ethical and compassionate manner while still providing themselves and their owners with an income and the tourists with an exotic experience. We, as tourists, can help promote this new concept of elephant tourism by asking at tour agencies where we can go to watch the elephants rather than ride them, where we can see them happily interacting naturally in groups, rather than being isolated from their friends and family, or doing things that come unnaturally to them such as standing on their hind legs or painting pictures. 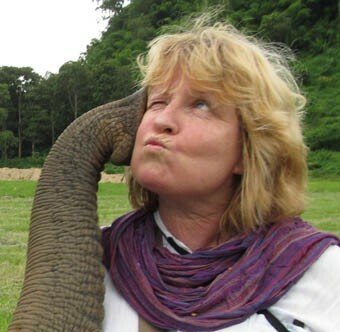 If we all do this when we travel to countries that use domesticated elephants, the tourism industry will gradually change to contain more ethical and positive experiences for all involved – the owners, mahouts, local villagers, tourists, and most importantly of all, the mightiest land animals that walk the earth – the elephants themselves. This entry was posted in Elephants, Ravings - random wafflings, Ravings on Thailand and tagged Chiang Mai, elephant, Elephant Nature Park, Thailand. Bookmark the permalink.